Self Inking Stamp, Select Above COLOR OPTIONS For Black Blue Green Purple or Red Self Inking Stamp or a Wooden Handle (requires a separate ink pad). Click customize now, upload your scanned or photographed signature. Best results are a clear image on a white background! We accept JPEGS, PDFS, PNG if you have any issues please send us a message - we will be glad to help! These Personalized Self Inking Custom Stamps Are 100% Made In The USA, The Stamp Size (Is Approx.) -3/4 X 1 7/8 (18mm X 47mm). We Have Super Fast Processing And Shipping - Our Custom Rubber Stamps Are Made In House And We Aim To Have Your Order Made And Out For Shipping Within 24 Hours Of The Order Being Processed! These Rubber Stamps Should Last 20,000 Impressions Before Needing To Be Re-Inked - Any Difficulties, Just Let Us Know! 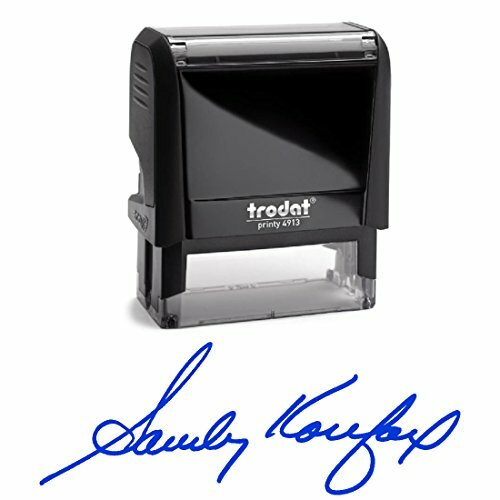 Custom Self Inking Stamps Are A Great Gift, For Teachers, Students, Children And Adults. Oh And Of Course - Ourselves! Plenty Of Uses For These Unique Personalized Stampers. Great For; Naming Work, Naming School Books, Signing Off Letters, Marking Homework, Using As A End Of School Year Book Signature Stamp, Stamping Library Books - This Book Belongs To, From The Classroom Of, Property Of. Also Great For Naming Artwork, Signing Off Work Sheets With A Bit Of Flare, Christmas And Holiday Cards, Envelope Signing, Embossing Creations And Card Making - The List Is Endless! If You Would Like to add a Logo, Increase Size or Anything Else - Please Send Us A Message With Your Personalized Request And We Will Be Sure To Find A Solution To Help! Pixie Perfect Stamps Pride Ourselves On Quality And Care For Our Customers. If you have any questions about this product by Pixie Perfect Signature Stamps, contact us by completing and submitting the form below. If you are looking for a specif part number, please include it with your message.